This website is managed by the House of Commons. The content of this site is updated on an ongoing basis, but may not always be complete or current and may not be identical from one viewing device to the other. Should there be a discrepancy between the Our Commons’ count-down clock that indicates the time remaining before a vote in the House of Commons and the official count-down clock that is used in the Chamber, the latter will be considered the official time of record. As per the Constitution and the Parliament of Canada Act, the general and public law of Canada includes parliamentary privilege, which consists of the privileges, immunities and powers held, enjoyed and exercised by the House of Commons and its Members. Parliamentary privilege enables them to carry out their constitutional functions free from external interference. Parliamentary privilege is one of the safeguards of the constitutional separation of powers. The House of Commons website contains content protected by parliamentary privilege. Publication of the content on this website has been authorized by the House of Commons. Visitors should be aware that if they reproduce or republish privileged material, they may not be protected by parliamentary privilege. The Official Languages Act applies to the House of Commons, which is committed to ensuring that information that is accessible to the public and services made available through this website are provided in both official languages (English and French). The proceedings of the House of Commons and its Committees are hereby made available to provide greater public access. The parliamentary privilege of the House of Commons to control the publication and broadcast of the proceedings of the House of Commons and its Committees is nonetheless reserved. All copyrights therein are also reserved. Reproduction of the proceedings of the House of Commons and its Committees, in whole or in part and in any medium, is hereby permitted provided that the reproduction is accurate and is not presented as official. This permission does not extend to reproduction, distribution or use for commercial purpose of financial gain. Reproduction or use outside this permission or without authorization may be treated as copyright infringement in accordance with the Copyright Act. Authorization may be obtained on written application to the Office of the Speaker of the House of Commons. Reproduction in accordance with this permission does not constitute publication under the authority of the House of Commons. The absolute privilege that applies to the proceedings of the House of Commons does not extend to these permitted reproductions. Where a reproduction includes briefs to a Committee of the House of Commons, authorization for reproduction may be required from the authors in accordance with the Copyright Act. Nothing in this permission abrogates or derogates from the privileges, powers, immunities and rights of the House of Commons and its Committees. For greater certainty, this permission does not affect the prohibition against impeaching or questioning the proceedings of the House of Commons in courts or otherwise. The House of Commons retains the right and privilege to find users in contempt of Parliament if a reproduction or use is not in accordance with this permission. This website has been created for the purpose of providing Members of the public with direct access to information about the House of Commons. The content of this website is covered by the provisions of the Copyright Act and related regulations and international agreements. Permission to reproduce—in whole or in part—or to otherwise use the content of this website may be sought from the appropriate source. This website also includes material that is subject to copyrights held by third parties. Visitors should therefore be aware that they may need to seek permission from the third party to reproduce or otherwise use such material. The House of Commons respects the privacy of visitors to this website. Personal information that visitors directly provide to the House of Commons is used for the purpose for which that information is provided. Such information, as well as information that may be collected due to the browsing of this website by visitors, is kept in accordance with House of Commons best practices in information management and IT security. The House of Commons website continuously seeks to improve the experience of its visitors while respecting their privacy. They track what content is viewed on a site which helps website administrators ensure visitors find what they are looking for. 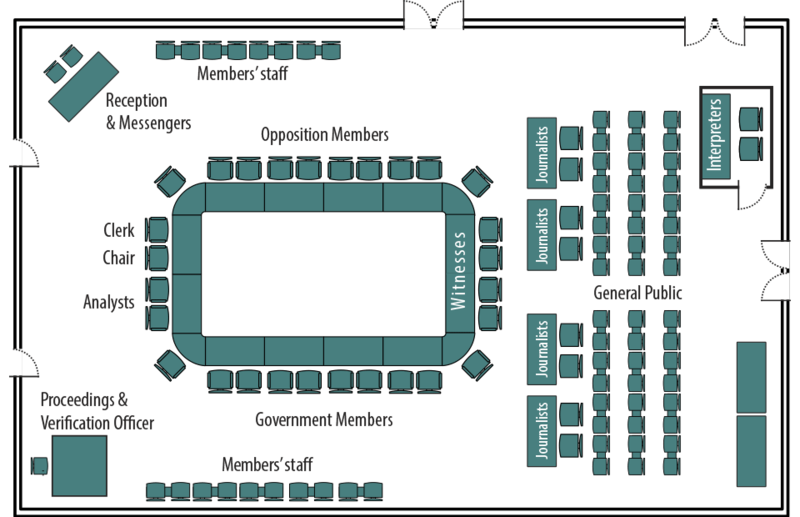 The House of Commons uses sessional and persistent digital markers on its website. During your on-line visit, your browser exchanges data with the servers where the website is located. The digital markers used do not allow the House of Commons to identify individuals and do not contain personal information. You may adjust your browser settings to reject digital markers, including cookies, if you so choose. However, it may affect your ability to interact with the House of Commons website. Web analytics is the collection, analysis, measurement, and reporting of data about Web traffic and visits for purposes of understanding and optimizing Web usage. Information in digital markers may be used in conjunction with computer request data to identify and track your online interactions with the website. The House of Commons uses Google Analytics and log file analysis to improve its website. When your computer requests a page found on the website, information is collected and used for Web analytics but does not allow to personally identify you as an individual. Hyperlinks to external or unaffiliated sites found on this House of Commons website are for information purposes only. The House of Commons is not responsible for the content or practices of such sites. While efforts are made to ensure that hyperlinks are current and up-to-date, this is not guaranteed. The House of Commons is not responsible for any damage that may result from the use of the content of this website or from any failure of performance, error, omission, interruption, deletion, defect, delay in operation or transmission, computer virus, communication line failure, theft or destruction, or unauthorized access to, alteration of, or use of information under any cause of action. There is no obligation on the part of any Member of Parliament to sponsor an e-petition. Neither the House of Commons nor any Member of Parliament sponsoring a petition endorses the views or information contained in any e-petition posted on this website. Moreover, they do not make any representations about, or assume any liability for, any of the information set out in any e-petition. No e-petition posted on this website is protected by parliamentary privilege until presented by a Member of Parliament to the House of Commons. The House of Commons maintains several official social media accounts which are listed on the social media page. The aim of these official accounts is to provide improved access to information about the House of Commons and parliamentary activities, as well as to facilitate the sharing and reuse of such information. The House of Commons social media accounts complement other more comprehensive sources of information such as the House of Commons website. General interest content, including photos, audio, video and links to websites. The House of Commons does not publish any material considered to be of a political or partisan nature or that aims to support or oppose a political party or one of its Members. While current government or private Member proposals, decisions and recommendations in the ordinary course of business may be referred to in posts, posts must not refer to party manifestos or the like and must remain of neutral nature. The principal purpose of the House of Commons social media presence is to provide information about the House of Commons and parliamentary activities and not to actively initiate or participate in discussions and debate about public policy. For discussion of public policy issues users/followers are encouraged to directly contact their Member of Parliament. The number of posts generated by official House of Commons social media accounts will vary depending on the purpose of the account, the parliamentary calendar and the level of parliamentary activity. The House of Commons will provide the timeliest coverage possible based on available resources. Most posts, including responses to comments and questions, will occur on weekdays (Monday to Friday) from 8:00 a.m. to 5:00 p.m. Eastern. Because the servers of social media platforms are managed by a third party service provider, official House of Commons social media accounts may be subject to downtime or outages that are out of the House of Commons’ control. As such, the House of Commons accepts no responsibility for platforms becoming unresponsive or unavailable. The appearance of a user as a follower of any official House of Commons social media account does not imply endorsement by the House of Commons. Following any particular user by the House of Commons also does not imply an endorsement on its behalf. The House of Commons respects users/followers’ privacy. The House of Commons will not follow users/followers that have a locked or private account. The House of Commons may share, like or retweet relevant material posted by other accounts if it is determined to be consistent with its social media objectives. The House of Commons may post links to websites that are not associated with or under the control of the House of Commons. These links are provided solely for the convenience of users/followers. The House of Commons does not offer any guarantee of the accuracy or reliability of the content and is not responsible for the information found through these links, nor does it endorse the sites and their content. The House of Commons looks forward to hearing from users/followers. Any constructive feedback about how the House of Commons can improve its social media presence and about the kinds of content that are of interest to Canadians is always welcome. All replies and direct messages will be read and any emerging themes or helpful suggestions will be shared with the appropriate authority within the House of Commons. Although the House of Commons may not be able to reply individually to all mentions, replies and direct messages, such messages will be handled on a case-by-case basis and responded to when possible and appropriate. If the House of Commons determines that a comment or question requires a response and that the information may be of broad or general interest, it may develop a formal response and distribute it through the channel(s) that it determines are most appropriate. The House of Commons may also invite users/followers to redirect their comments or questions to another House of Commons resource (e.g., the email address or phone number of the appropriate contact within the House of Commons). The House of Commons welcomes users/followers’ comments and interactions with its official social media accounts and expects that conversations will follow the general rules of respectful and civil discourse. What users/followers post should be relevant, truthful, accurate, not misleading and be offered in good faith. By commenting on materials made available via social media by the House of Commons, users/followers agree to be solely responsible for everything that they post and all information they contribute, link to, upload or share. All posted comments are in the public domain. that contain hyperlinks to other sites that contain content that falls within the descriptions set forth above. anything else the House of Commons deems inappropriate. Many social media platforms have multiple language options and provide instructions on how to set user preferences. The House of Commons respects the Official Languages Act and is committed to ensuring that its information is available in French and English and that both versions are of equal quality. The House of Commons replies to comments in the official language in which they are posted. If the response is determined to be of general public interest, the House of Commons may develop a formal response in both official languages and distribute it through the channel(s) that it determines are most appropriate. The House of Commons may share links that direct users/followers to sites of organizations or other entities that are not subject to the Official Languages Act and available only in the language(s) in which they are written. When content is available in only one language, the House of Commons makes an effort to provide similar content in the other official language. Information, including images and videos, that the House of Commons posts on its social media accounts is subject to Canadian copyright laws with all rights reserved, unless otherwise specified. Official House of Commons social media accounts are not hosted by the House of Commons and represent only the House of Commons’ presence on third-party service providers. Users/followers are encouraged to read the privacy policies of all such service providers. The House of Commons respects the privacy of users/followers. Information that is shared with the House of Commons is used only for the purpose for which it was provided and is kept in accordance with standard information management practices. As a matter of safety and best practice on the internet, users/followers are advised not to share personal information. Personal information includes home addresses and telephone numbers, photographs containing images of identifiable individuals, and any other information personal information. The public is encouraged to contact the House of Commons at the following address: infonet@parl.gc.ca.